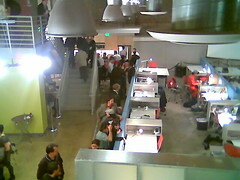 Last week, the IDSA Connecting Congress was held in San Francisco. My good friend Gary was in town for it, so we got a chance to catch up, and go to some parties together with friends. And we caught a great lecture by Alan Wexler (unrelated to the conference). Coincidentally, we’d seen him lecture at Cranbrook, about 10 years ago, and it was interesting to see how his work has evolved since then. I really admire his devotion to a design process he’s developed, no matter how unusual the results. His process has some relationship to the scientific method, and he’s very rigorous about his explorations. 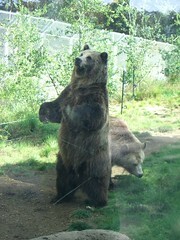 Jason and I went to the San Francisco Zoo for the first time last weekend. 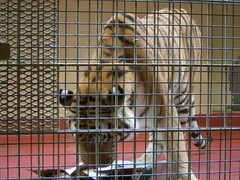 We were lucky to catch both the big cats and the grizzlies eating their lunch. One grizzly wanted seconds. 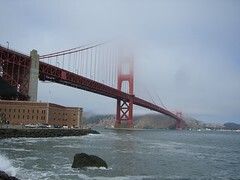 Jason and I walked along SF’s Crissy Field for the first time last weekend; it was nice to be by the water. And last week I met up with Hung to talk about refining the salt and pepper again. I was thinking of going back to something like my first, simpler design, as the machine I’ve been prototyping on isn’t the highest resolution, and simpler designs work better with it. But now I have an opportunity to print it on a higher resolution machine, so we’ll try the detailed version again, with some alterations. They should print differently on a higher resolution machine. Right now, too much seasoning pours out the lids, so we’ll try smaller holes. The higher resolution machines will be very useful for other projects, so there are lots of exciting possibilities. 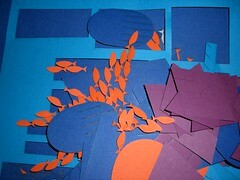 Last week I also used the laser cutter to cut an initial design for a holiday card. The design turned out to be a little too convoluted in it’s current form, unfortunately. But the level of detail you can get is just amazing. And I cut out some Sliceform files, downloaded from a website. 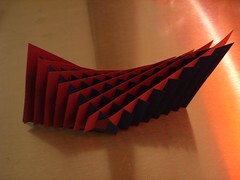 Sliceforms are paper representations of mathematical models, and they’re pretty fascinating visually and conceptually. Several years ago, I bought a Sliceform book by John Sharp, and am finally trying the models out. 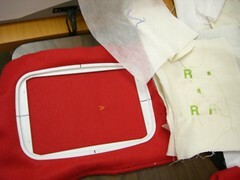 Also, Kaho and I took a CNC embroidery class last weekend. The sewing machine will automatically sew your design — you don’t even have to touch it once it’s set up. It’ll sew a design based on any vector file — you can basically sew any graphic image in multiple colors. Lots of great possibilities there too. We’re flying from Minneapolis to San Francisco, our last leg home from London, and my eyeballs hurt from dry planes. We were in England for Jason’s cousin’s wedding. 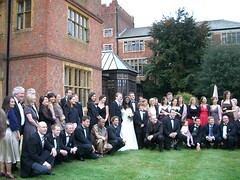 The wedding itself was in Ware, a 40 minute train ride from London. It was great to finally meet the bride, and members of Jason’s extended family I’d never met. Judging from the plumage at the lovely ceremony, Irish milliner Philip Treacy was well represented. 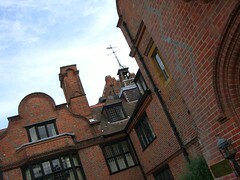 The reception was held at a grand old pile, originally built in the Jacobean style, and added on to in just about every subsequent style. Now it’s a hotel, and a pleasant place to stay — I wished we’d had more time to explore. We spent the next few days in London, staying with friends. And managed to catch up with Felicia, an Aussie friend we met in Cambodia on our long honeymoon. Unfortunately, a grey and rainy London didn’t present many tempting photographic opportunities. Fortunately, it did present shopping opportunities. 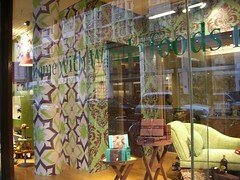 Walking down the street past a Whole Foods, this London outpost looked so much more designed than those in the US (New York at least), with its trend du jour neo-Victorian-wallpaper-meets-Flatland aesthetic window display. 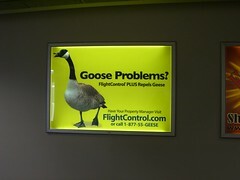 Back at the Minneapolis airport, this sign brought back memories of the Midwest goose scourge, and of goose-clogged medians in Detroit.